When contemplating extending your home outwards or upwards, the very first thing you need to consider is your budget: how much money are you willing and able to spend on the project and is this going to be enough for what you desire? Once you have answered the first part of this question – how much money you wish to spend – you can tackle the second part of the question by requesting accurate estimates from local building contractors. If you have never solicited quotations before, the short guide below will help you to get the job done quickly and efficiently, without any unnecessary drama. Before you start asking for quotations, consider the following points carefully. A little homework beforehand can save you a lot of time and money in the long run. Reputation – To avoid wasting time soliciting quotes from contractors without the knowledge and experience to carry out the work you wish to have done on your home, look for companies that have a solid reputation in the area: companies that are widely recognized as being good at what they do. In this way, you will be able to ensure that the quotations you receive are from companies capable of handling all types of home additions in Toronto with ease. Proximity – While there is no need to focus exclusively on construction companies that are in your neighbourhood, it is a good idea to limit your search to those that are located in the GTA and therefore have plenty of experience working with local homeowners. While the physical process of extending residential properties may be very much the same in all parts of the country, a company that is familiar with the local building code and how to apply for permits will be able to make your life a little easier. Accuracy – If you want to make sure the proposals for home additions in Toronto you receive are accurate, you need to factor in the time for home visits from each contractor you approach. While you should be able to obtain rough estimates over the phone, a property inspection will be required if you want figures on which you can rely. Scheduling – When you first get in touch with local building firms it is a good idea to tell them when you are hoping to have your home addition built. By letting them know upfront, you will be giving them the chance to decline to quote in the event they are unable to perform the work within the desired time frame. However, if you have your heart set on a particular contractor, you may wish to be a little flexible with regard to the completion date that you have in mind. To obtain a highly competitive estimate from a company that specializes in home additions in Toronto, please call us during business hours or use the quotation request form on our site. 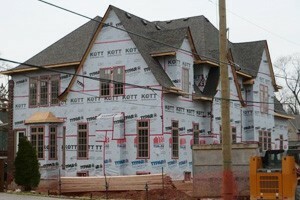 We have completed many residential projects in the past and have a reputation that is second to none. Whilst underpinning the existing foundations of a residential property is often the best choice for those who wish to enlarge their basement and convert it into extra living space, it is not the only possibility. If the ceiling of your below-grade space is currently too low to make turning it into a living area a practical proposition, there are 3 potential solutions you may wish to consider, one of which is underpinning. In this article, we are going to take a brief look at each option to help you decide which one is the best choice for your property. As usual, if you have any questions after finishing the article, or you would like to request a quotation for a complete basement conversion, please do not hesitate to call and speak to us during office hours. 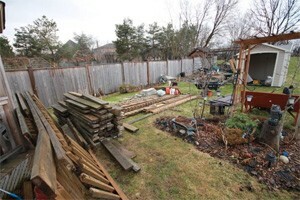 Some contractors offer all of the below options while others may specialize in just one or two. 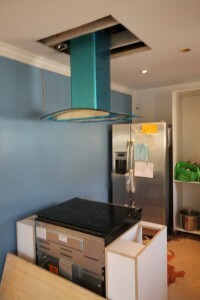 Your choice of solution may therefore affect your choice of contractor too. Benching – Bench footing is a method of lowering the floor of your basement that does not involve excavating underneath the existing foundations. Because of this, it is cheaper than underpinning and should not pose any risk to the structural integrity of your home. Of course, a reputable contractor with years of relevant industry experience should be able to use either method without causing any damage to your home so the best thing to do, if you want to give yourself the widest choice of solutions, is to work with an established and accredited company with years of experience underpinning Toronto basements. 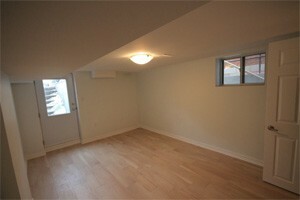 However, if you wish to lower your basement floor and you are on a tight budget, benching may be worth considering. Just bear in mind that it does involve the pouring of concrete inside the existing foundations so you will lose a little square footage in the process. Raising the First-Level Floor – A far less common solution but one that sometimes works well in bungalows is the pouring of more concrete onto the top of the existing foundations rather than underneath or inside of them. This approach results in the first-level floor joists being raised, along, of course, with the floor itself. The reason that it works better with bungalows than 2 or 3-storey properties is because it is usually easier to raise the first-floor ceiling in a bungalow, for obvious reasons. Underpinning – When done correctly, underpinning a Toronto basement is definitely the most elegant solution for homeowners who want to convert their below-grade space into a new living room, den, or games area. The foundations are extended downwards with this method, with no benching intruding on the existing floorspace of your basement. The end result is a usable living area with a ceiling height of around 8 or 9 feet, which is perfect for most people’s needs. Call the underpinning Toronto experts today to request a competitive quotation for your basement conversion project. We look forward to helping you in the very near future. Mass pour underpinning is the most commonly used method when undertaking basement conversion projects or strengthening the foundations of a property for structural reasons. Although it is not a job for the DIY enthusiast, owing to the excavation work and the fact that it may affect the structural integrity of your home, it is not a particularly complicated process and can be explained in a few easy-to-understand steps. When you hire a local contractor to underpin your foundations, whether to make better use of your below grade space or to improve the structural integrity of your home, they will follow the steps below if they are using the mass pour method. Site Survey – The first thing that your contractor will want to do is to survey your property in order to make sure that mass pour underpinning will meet your needs and will not cause any unexpected issues. Application for Building Permit – If you are underpinning a Toronto property, you will need a building permit before the work can commence. Your contractor will draw up detailed plans and prepare all the necessary documentation to submit with your application to the local municipality. 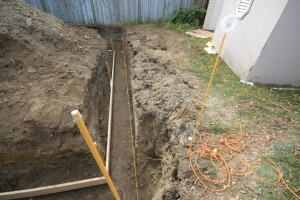 Digging of Holes Under the Footing of Your Property – The concrete slab on which your foundation walls are standing is known as the footing and its purpose is to spread the load from the walls to the land on which your home is situated. Your contractor will dig holes underneath the footing in small sections, not all at once. 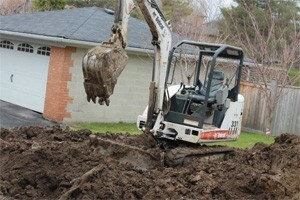 The reason the holes are dug in small sections is because the footing is supporting your property! 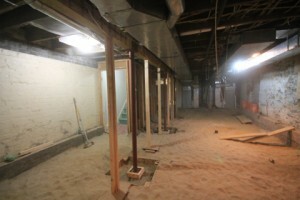 Filling Holes with Concrete – After each hole has been excavated, it will then be filled with concrete. Non-shrink grout is often used to fill the last couple of inches of each hole, to avoid the possibility of air pockets forming between the footing and the new concrete underpinning. Once the first hole has been filled in this manner, the next one will be dug, and so the process continues. Installation of Waterproofing Membrane – To protect your basement from water damage, a waterproof membrane will be added when underpinning your Toronto home. This will be done once the mass pour stage has been completed. Backfilling and Interior Waterproofing – The exposed foundation walls will now be backfilled and the interior of your basement can then be waterproofed with a weeping tile system and strategically positioned drainage pipes. These are the basic steps that your contractor will follow although there is a little more to the process than this. If you would like full details of what underpinning a Toronto home involves, or you would like us to prepare a proposal for the underpinning of your property, please do not hesitate to call us whenever you have a few minutes to spare. We have completed many such projects in the area and would be delighted to help you complete yours. Homeowners in Toronto who would like a little more living space but are not keen on the idea of moving may like to consider a home addition instead. There are several different types of additions that are popular with local residents, each of which we are going to consider in the section that follows. Whichever type you choose, you will of course want to make sure that the building contractor you hire is capable of carrying out the necessary work to a high standard and at a competitive price. 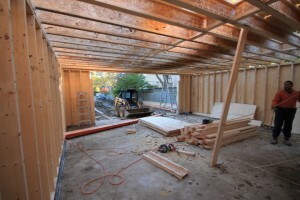 Addition of Another Storey – If you need a lot of extra space and obtaining a building permit will not be an issue, adding another storey to your home may be an option that is worth considering. However, you should bear in mind that in order to do this, it may be necessary for your home addition contractors in Toronto to strengthen the foundations of your property first, by underpinning them. Garage Conversion – Whilst not strictly an addition in the literal sense of the word, a garage conversion will add to the usable living space at your disposal so can be considered in the same category as ground and upper-storey additions. It is one of the least expensive options available to homeowners in the area and can often be completed relatively quickly. A Bump Out – Similar to a Ground Floor Addition, a bump out is smaller in scope and normally involves making an existing room, such as a kitchen or living room, bigger. It is perhaps not the best choice if you want to get the biggest return on your investment in terms of extra space but may be worth considering if all you really need is a slightly larger kitchen or living area. These are the main types of additions that local homeowners have built on their properties every year but there are other possibilities if none of these appeal. To find out exactly what is and what is not possible for your particular property, call the best home addition contractors in Toronto today: we look forward to working with you in the very near future.